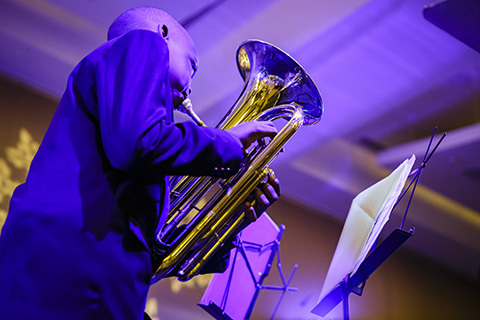 The Winter Wonderful Frost Holiday Dinner provides all music lovers with a meaningful giving opportunity to impact the lives of hundreds of Frost School student musicians. By purchasing individual tickets, or a Diamond, Platinum, Gold or Patron Circle table at Winter Wonderful, your donation will help the award-winning Donna E. Shalala MusicReach mentoring program, a multi-tiered music outreach program providing underserved teens in our community with instruction, positive life choices, and preparation for higher education. Frost undergraduate music students act as mentors under the guidance of graduate teaching assistants, intertwining community service with their university experience. Last year’s gala raised enough money to mentor 20 new teens for four years through our Donna E. Shalala MusicReach program. Help us reach or surpass this goal once again this year! With your Winter Wonderful donation, you are also supporting academically and artistically gifted vocalists, instrumentalists, composers and conductors, plus the world’s future music educators, music therapists, researchers, music engineers and music industry professionals, to reach their career goals and positively influences the world through their musical excellence and mentorship of others. We encourage you to make a meaningful holiday contribution today, your generosity allows to continue our shared mission.